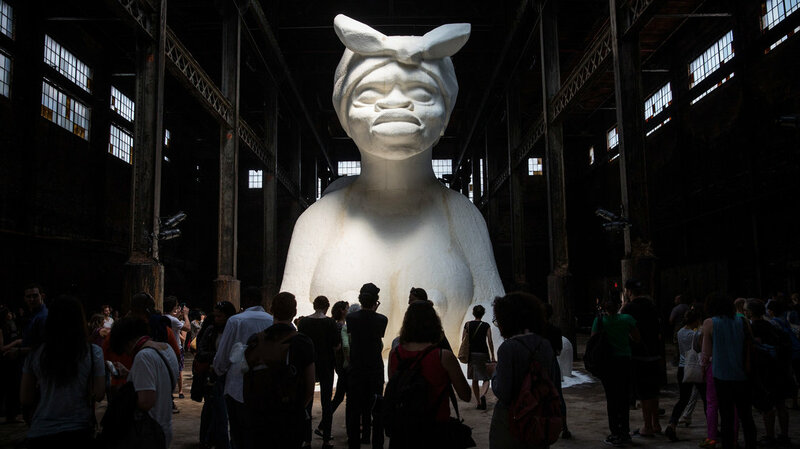 Kara Walker’s “A Subtlety,” on display at the Domino Sugar Refinery in Brooklyn. The record is there for all to read. It resounds all over the world. It might as well be written in the sky. One wishes that Americans…would read, for their own sakes, this record and stop defending themselves against it. Only then will they be enabled to change their lives. The fact that they have not yet been able to do this—to face their history to change their lives—hideously menaces this country. Indeed, it menaces the entire world. I read an article last week that got me thinking about our nation’s tortuous relationship with its own history. The piece, in Brooklyn Magazine, was about a recent art installation by Kara Walker, a celebrated black artist who explores race, sexuality and gender in her work. Walker’s sculpture, A Subtlety, is a 75-foot tall, 35-foot long black woman positioned like the Sphinx made entirely of sugar. The sculpture is meant to get the viewer thinking about the history of appropriation of black bodies, the unpaid labor that drove the Triangle Trade (of which sugar was the main commodity), and the reverberations of the legacy of slavery. That the exhibit was held in the decaying hulk of the former Domino Sugar Refinery, a relic of the manufacturing past in gentrified Williamsburg, gives the project added emotional and historical heft. Unsurprisingly, a whole bunch a people didn’t get the message. I say unsurprisingly because it’s hard to invoke a history that most people are painfully, tragically ignorant about. Of all the roles I was asked to play as an elementary school teacher – educator, mentor, nurse, waiter, mathematician, older brother, tailor, babysitter, data analyst – I was proudest of being a history teacher. Imparting the wisdom of the ages to the next generation is a hard ask, and I was determined to get it right. Unfortunately, the history curriculum I was given was an exercise in propaganda. When it is taught in most schools (if it is taught at all), African American history is presented as a narrative separate from American history proper. This serves two purposes. First, it allows us to accept the version of America as the divinely-ordained protector of freedom and democracy you find in most textbooks. Second, it allows us to accept the “continuous progress” narrative of American history, where the nation confronts its challenges resolutely and with great courage. Everything is always better in the end. Hence, black people make an appearance during the Civil War, and then you don’t hear from black people again until the Civil Rights Movement. You might get something about the Harlem Renaissance. Contemporary textbooks take pains to include historically marginalized perspectives (Black, Hispanic, Native American, women, etc. ), usually as an inset or special feature added to an older edition. The effect is still a narrative of spectacular progress with periodic downers about how things weren’t so great for everyone, or a spotlight on one particularly successful minority. 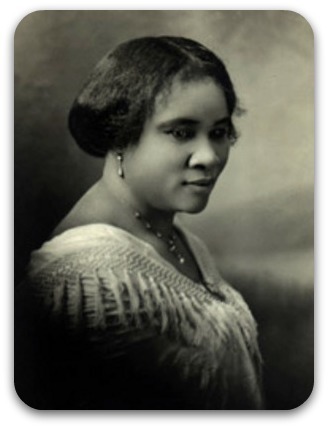 No offense to Madam CJ Walker, but if you’ve heard of her and have no idea who Fannie Lou Hamer is then your history teacher owes you an apology. This is tragic, because “African American” history is, in reality, just American history we would rather forget about. If you think about our collective historical consciousness as an iceberg, then the part visible above water is what we learn in classrooms across America. The part below the surface is the great, unseen narrative of plunder, violence, coercion, enslavement and disenfranchisement that is the foundation of the shining achievement seen above. American history divorced from “African American” history is a story of profit divorced from sacrifice. There is nothing I could write about reparations that hasn’t already been written much more eloquently by Ta-Nehisi Coates, in whose intellectual debt I will forever be, so I’m not going to try. Suffice it to say, that the rise of the nation from thirteen colonies, to economic superpower, to world hegemony would have been impossible without the 19th century slave economy. Even more damning, as Coates brilliantly lays out, the postwar creation of the wealthiest middle class on earth, and living standards the envy of modern man was aided and abetted by black exclusion and the deliberate destruction of black wealth. The true third rail in American politics has always been, as WEB Du Bois called it, the color line. This statement would seem to be absurd on its face, as the news media is dominated by stories about race, from Trayvon Martin to Donald Sterling, to some crazy white woman outside of Buffalo. This, however, is talk about race, not racism. Not white supremacy, the ancient bigotry that underlies and justifies the historical theft that has led to the present day. Though banished from public discourse, it lives on in hearts and minds, as well as laws and ordinances. Certainly not about “African American” history. To broach these subjects in the political sphere would be career suicide. And so the consensus way to approach the “problem of the color line” is to highlight and praise black individuals but view black people themselves as pathology. Today’s media is all Barack Obama and depressing statistics. It perfectly mirrors the juvenile approach of our school textbooks. “For history, as nearly no one seems to know, is not merely something to be read. And it does not refer merely, or even principally, to the past. On the contrary, the great force of history comes from the fact that we carry it within us, are unconsciously controlled by it in many ways, and history is literally present in all that we do. It could scarcely be otherwise, since it is to history that we owe our frames of reference, our identities, and our aspirations.